Get Cooking is about you discovering the home cook in you, your passion for food that you can enjoy, show off and share. Whether you’re a beginner or advanced in the kitchen, if you want to cook fantastic food we can help. Delicious dishes that impress don’t have to be complicated, the simplest combinations can be the best, turning your mealtimes into the ultimate pleasure. Each class or event is always a personal one teaching you simple, homemade and classic dishes to indulge in. New culinary skills are taught using fresh and wholesome ingredients – delivered to you in an accessible and friendly way. Our cooking classes range from Mediterranean, Spanish, Italian and South Asian to craft ale brewing, breadmaking, slow cooking, vegetarian and vegan. We offer half, full day and evening classes including a new range of fast cooking courses where you’ll learn quick and easy dishes to fit into your busy lifestyles. To us, the principles of home cooking extend throughout home and lifestyle. That’s why, if you love making food, drink and beautiful dishes we’re sure you’ll enjoy our crafting and wellbeing workshops too. Get Cooking is about doing more of what you love whatever that might be. Come to us looking for a cooking course and you might end up booking on a herbalism & natural cosmetic making workshop! Whatever you choose you’ll learn new skills and take something you’ve made home with you. Whether it’s just you, a group of friends or a team; we want you to feel at home with us. We offer team building events for businesses and private parties centred around cooking and crafting. Located in the vibrant area of Farsley, Leeds – a creative district with a growing number of independent businesses and eateries – we are easily accessible from other areas of Leeds and Bradford. Emily Carey has been teaching different groups of people to cook classic and original dishes for over eight years in various venues around Leeds. 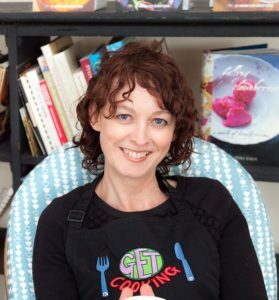 Driven by her passion to make cooking more widely accessible, Emily came up with the idea for Get Cooking in 2010 and has been continually developing her business and incorporating fresh ideas ever since; opening her unique cookery school in Farsley, Leeds, in 2016. From a young age Emily was made to feel that food was something exciting to be enjoyed. She grew up with parents who made most things from scratch and surrounded by a lot of culture – with a father teaching pottery and a mother involved with studying and writing books. Little cheeses, yogurt, bread, wine and beer were as well as clothes and some furniture were all home-made. Dinners were fashionably late and long drawn out affairs of mainly Mediterranean cooking influenced by Elizabeth David and many travels to France, Spain & Italy often squashed into an old Renault 4. Emily’s experiences of food continued to develop through a number of key people who strongly influenced her. It’s no surprise then that she has gathered a little food knowledge along the way. In some senses Get Cooking wasn’t planned – it just grew. Emily has always had a eye for good recipes, good ingredients and a natural flair for knowing what foods work well together. Although a busy working mum she can always cook up scrumptious home cooked feasts for friends and family described as “ one of the most sociable people I know.” That with some of the new ideas is the ethos she brings to Get Cooking.